PREPAREDNESS LEVEL for Southern California Operations has been elevated to LEVEL 3 due to significant fire activity today. GLORIA CA-BEU-2830; San Benito-Monterey Unit, Cal Fire. 5,000 acres, 15% contained. Four miles east of Gonzales, CA. Brush and grass. Active fire behavior with long-range spotting. Residences and major transmission lines threatened. Highway 146 closed. Evacuations in effect. The fire continues to spread to the southeast and Hwy 146 is closed. 100 homes and 50 commercial properties are threatened, and one resident was destroyed. The fire is threatening the 230 KV transmission lines that provide power to the King City Basin and the San Ardo Oil Fields. It could reach the Pinnacles National Monument within the current operational period. STATION CA-ANF-3622, Angeles NF. IMT1 (Dietrich). Four miles north of La Canada, CA. Chaparral. Active fire behavior. Residences threatened. Road closures and evacuations in effect. 500 acres, 0% contained. 510 total personnel. DIETRICH (TEAM 5) CIIMT Type I Incident Management Team has been mobilized to the STATION incident with a transition scheduled for 1800 hrs. last night and a tentative in-briefing scheduled for 1000 hrs. today at 1000 hrs. in Arcadia, CA. PV Fire; Los Angeles County Fire, Rancho Palos Verdes 230 acres - 70% contained. Phone Numbers (323) 881-2411 (Los Angeles County Fire Public Information Line) BIG MEADOW CA-YNP-3660, 1700 acres, 0% contained. McGowan’s CIIMT Team 1, a Type 1 Incident Management Team, is being mobilized to this incident.Yosemite National Park, NPS. Transfer of command from IMT2 (Johnson) to IMT1 (McGowan) will occur today. Two miles northeast of El Portal, CA. Brush. Active fire behavior with sustained crown runs and spotting. Residences threatened. Road closures and evacuations in effect. 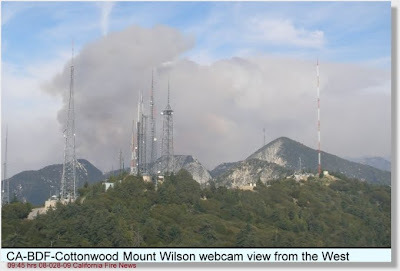 COTTONWOOD CA-BDF-11578, 1,000+ acres, 5% containment Forella’s SOCAL TEAM 3 is being mobilized to this incident. C3101 requested 10 closest engines for Structure Protection in the area of wellington and 74 this AM. The Fire is approximately 1 mile east of Cranston and 10 miles east of Hemet in the San Jacinto Mountains and is currently at 1000 acres. Overnight, the fire grew in the north and northwest corners. The Big Bear Hotshots completed a successful firing operation on the eastern flank of the fire, which is holding, preventing growth toward Idyllwild. Additionally, crews worked throughout the night with dozers and firing operations to reduce the risk to the homes along Highway 74. MORRIS FIRE CA-ANF-3616, Angeles NF. IMT2 (Woychak). 2068 acres, 60 % contained. Five miles north of Azusa, CA. Chaparral. Creeping with isolated torching. Residences threatened. RIDGE CA-MCP-2601,Camp Pendleton Marine Corps Base, DOD. 250 acres, 10% contained, Nine miles west of Fallbrook, CA. Timber and chaparral. Moderate fire activity with short-range spotting. Fire is located on Camp Pendelton Marine Base 11 miles north of the City of Oceanside. Fire is in vegetation only in steep terrain. Temperatures are around 100 degrees, RH 12%, Winds west @ 12 MPH. Growth potential is MEDIUM. BRYSON 2 CA-BEU-002816; Started 08/26/09 at 1326 hours. San Benito-Monterey Unit, Cal Fire. The fire has burned 2,754 acres and is 60% contained. Twenty miles southwest of King City, CA. Brush. Moderate fire activity. 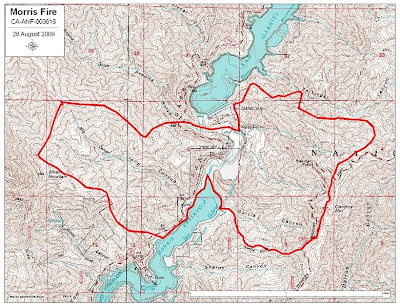 The fire is expected to be contained 08/28/09. At this time the forward spread has been stopped, personnel are working to complete control lines, little spread is expected. DAY FIRE, CA-LMU Klamath NF. Lassen-Modoc Unit, Cal Fire. Five miles northeast of Pittville, CA. Day Road near Highway 299E in heavy Timber. Active fire behavior. Residences threatened, currently is 1250 acres with 10 percent containment. RED ROCK, CA-KNF Klamath NF. NIMO (Custer) and IMT2 (Paul). The teams are also managing the Harrington incident. Fifteen miles west of Fort Jones, CA. Timber with heavy dead and down fuels. Moderate fire activity with isolated torching. Structures threatened, currently is 1277 acres with 75 percent containment. HARRINGTON Incident, CA-KNF is 165 acres with 80 percent containment. Any news on the other two fires that are burning on Camp Pendleton?